Firefighters continued battling multiple large wildfires Saturday raging across more than 170,000 acres in California, from the coastal foothills near Santa Barbara to retirement homes, golf courses and racehorse stables in San Diego County. The dry, hot, windy conditions across the region that have fueled what would be extreme for any season, but are especially stunning just two weeks from winter. The critically dangerous conditions were forecast to persist into the weekend as 5,700 firefighters work to contain the blazes, which have forced 200,000 from their homes and destroyed more than 800 structures. "This is the new normal," Gov. Jerry Brown warned Saturday after surveying damage from the deadly Ventura County fire that has caused the most destruction. "We're about ready to have firefighting at Christmas. This is very odd and unusual." The Creek Fire in Sylmar, California, forced the Padilla family to evacuate at 4 a.m. without time to bring their horses with them. Upon returning to the ranch, the family was devastated to find they had lost nearly 30 of their horses. The Ventura County medical examiner said late Friday afternoon that 70-year-old Virginia Pesola of Santa Paula was killed in a car crash along an evacuation route Wednesday night. The cause of death announced Friday was blunt force trauma with terminal smoke inhalation and burns. 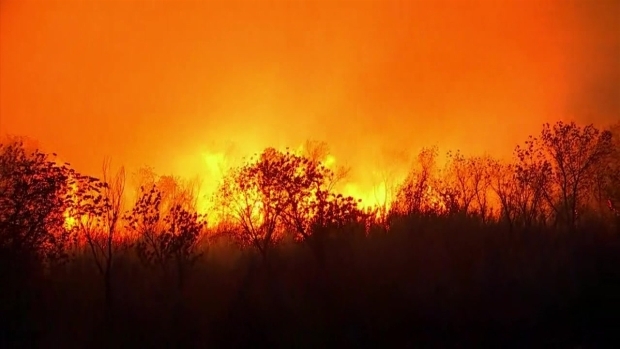 Pesola's death is the first connected to the wildfires ravaging the region. She was found in a car in Wheeler Canyon in Santa Paula. The area northwest of Los Angeles was threatened by a wind-whipped blaze that erupted Monday and has destroyed hundreds of homes. By Friday evening, officials said they were lifting the evacuation order for the city of Santa Paula. The latest front in the fire fight opened up Thursday night north of San Diego, where the 4,100-acre Lilac fire tore through dozens of houses in the tightly packed Rancho Monserate Country Club community in the small city of Fallbrook near Camp Pendeleton, known for its avocado orchards and horse ranches, where some thoroughbred race horses were killed. It exceeded 6 square miles in a matter of hours and was threatening to make its way along a highway to the ocean and a major Marine base. Three people were burned while escaping the flames and at least 85 buildings were destroyed, authorities said. 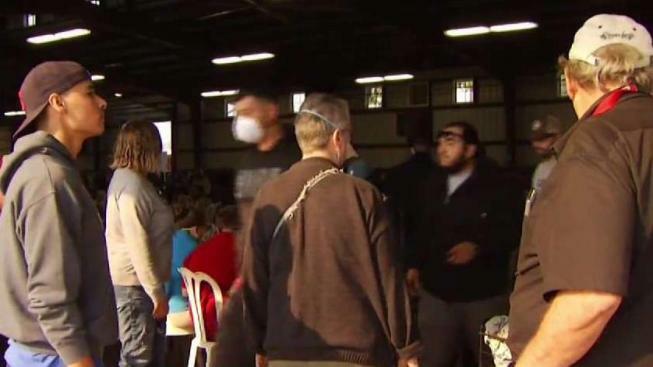 Officials estimate that around 10,000 people had to evacuate due to the Lilac fire, and around 900 of them were staying in makeshift shelters — in schools and casinos — in the area. Homeowner Mike Connor and his family safely evacuated their home, but the Thomas Fire completely destroyed the place they once called home. Patrick Healy reports for the NBC4 News on Tuesday, Dec. 5, 2017. Trees were charred for miles along winding State Route 76 in the community of Bonsall and some houses lay in ruins on a road not far off the highway. At one home, a goose and a rooster remained, the latter crowing repeatedly Friday morning. The fire remained uncontained, although the winds subsided significantly overnight. Forecasters said they would return later in the day but would be less widespread. The fire was on the eastern border of the Marine Corps' vast Camp Pendleton. 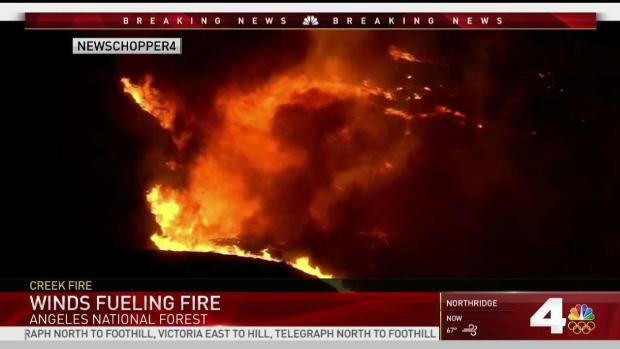 Authorities said 1,000 firefighters battled the flames with help from a fleet of air tankers and helicopters. Significant resources also were being deployed to stamp out a new, small fire that began to the east in the Cleveland National Forest near the mountain town of Alpine. Meanwhile, firefighters in Ventura — 130 miles to the north — gained some control over the largest and most destructive fire in the state, which has destroyed at least 500 homes in the area. The Thomas fire has grown to about 148,000 acres since it broke out Monday, bringing a state of emergency from Gov. Brown. Fire crews made enough progress against large fires around Los Angeles to lift most evacuation orders. Driven by winds above 35 mph, the Lilac fire in the San Diego area razed rows of trailer homes in a retirement community, leaving charred and mangled metal in its wake. A wind-fueled brush fire scorched at least 5,000 acres with 5 percent containment in the Santa Clarita area Tuesday, Dec. 5, 2017, prompting evacuations of schools and 1,300 homes. It wasn't immediately known what sparked the fire next to State Highway 76, but strong winds carried it across six lanes to the other side. Cynthia Olvera, 20, took shelter at Fallbrook High School. She had been at her Bonsall home with her younger sister and nephew when her father called from the family nursery to say the fire had reached the gate of their sprawling property. After starting to drive away, the family turned around to recover forgotten personal documents — but it was too late. Trees were ablaze and flames were within 10 feet of the house. "I didn't think it would move that fast," she said. Her older sister wanted to drive in to save her husband's car, but Olvera told her: "Don't do it. It's not worth it." As the dangerous Creek Fire scorched through Angeles National Forest, the devastating fire has so far destroyed 30 structures and injured two firefighters. Beverly White reports for the NBC4 News at 11 on Wednesday, Dec. 6, 2017. Her sister heeded the advice and the family made it safely to the school. But the flames followed them, and the family had to pack up again when evacuation orders came for Fallbrook High School. The family went to a second shelter, not knowing if their house survived. Herds of horses galloped past flaming palm trees in their chaotic escape of a normally idyllic place. Not all survived. "We almost got trampled to death," trainer Kim Marrs said. "One gal got knocked down. I thought she was going to get crushed. You just had to stand there and pray they didn't hit you." Most of the loose horses were corralled and taken to Del Mar Fairgrounds, but about 25 died as barns and pasture burned. 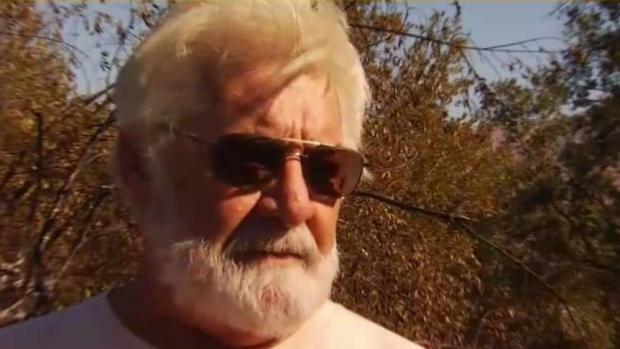 Kevin Kelly, who lost his wife to cancer a mere two weeks prior, endured more heartache as flames from the Creek Fire burned down his home on Wednesday, Dec. 6, 2017. The home had been in Kelly's family for 60 years. Editor's Note: An earlier version of this caption misstated the name of the fire that destroyed Kevin Kelly's home. It was the Creek Fire, not the Skirball Fire. Surviving horses were taken to Del Mar race track and all of Friday's races at Los Alamitos Race Course were canceled as the racing community mourned. Along the coast between Ventura and Santa Barbara, tiny communities had so far mostly survived close calls. Slopes along U.S. 101 were blackened, but homes remained standing at La Conchita and Faria Beach. 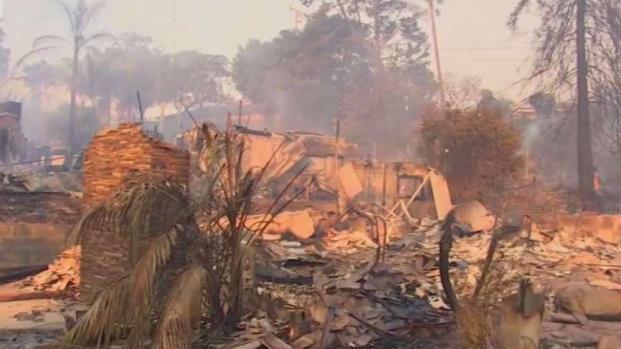 Sections of Carpinteria were under mandatory or voluntary evacuation orders, but no flames were in sight early Friday. A group of five lifeguards-turned-volunteer fire brigade helped stop the flames at nearby La Conchita, a hamlet of 325 people, NBC News reported. They scouted the fire as it approached, then sprinted to the area it threatened first, warning homeowners, turning on sprinklers in empty houses and wetting down trees and shrubs with garden hoses. "It's nice to know when you leave that there are people here who will look out for you," said Sue Harrison, head of the La Conchita Community Organization. The Skirball fire has burned over 450 acres with most of the fire burning inaccessible terrain that hasn't burned in decades. 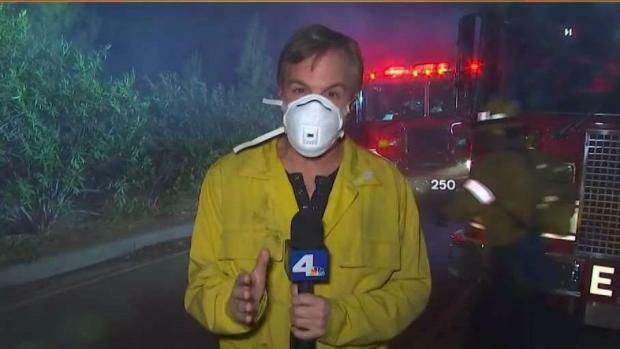 Robert Kovacik reports for the NBC4 News on Wednesday Dec. 6 at 11 p.m.
Inland from the coast the big fire burned vigorously in mountains near the town of Fillmore, but only outlying areas were evacuated. It also remained a threat to Ojai, a scenic mountain town of 7,000 people dubbed "Shangri-La" and known for its boutique hotels and New Age spiritual retreats. On Thursday, ash fell like snowflakes on citrus orchards scattered around town and on Spanish-style architecture as firefighters parked their trucks around houses in anticipation of winds picking back up. Associated Press writers Amanda Lee Myers, Julie Watson, Brian Skoloff, Brian Melley, Michael Balsamo, Chris Weber, Robert Jablon and John Antczak contributed to this report.